On 5 May 1842 the railway line from Vienna to Gloggnitz (State of Lower Austria) was opened. As early as 3 August 1842 an "Imperial Edict" decreed that the railway be extended over the Semmering (State of Styria.) 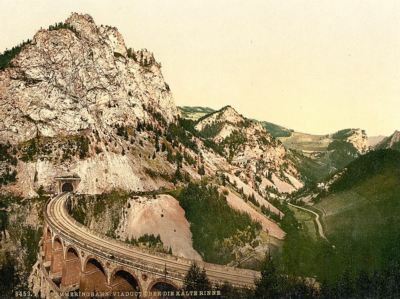 The Semmering Railway, built over 41 km of high mountains between 1848 and 1854, is one of the greatest feats of civil engineering from this pioneering phase of railway building. The high standard of the tunnels, viaducts and other works has ensured the continuous use of the line up to the present day.